A CSA cookbook we put together in 2010 caught the attention of the editors at Downeast Books who contacted Lisa and asked her to consider writing a cookbook dedicated to the concept of local, seasonal food. They loved the concept of a book with recipes that are some of our favorites, some that have been provided by our CSA members, and some from the chefs at the restaurants who buy our produce. 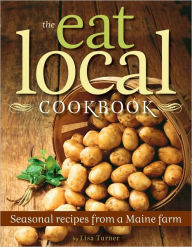 A year later “The Eat Local Cookbook”, written by your farmer Lisa Turner, was published by Downeast Books hit the store shelves. It has received excellent reviews. In fact, for a time it was No. 1 on the Portland Press Herald nonfiction best seller list! “The Eat Local Cookbook” is available at LL Bean, the bookstore at the Portland Jetport, and most local bookstores, but if you can’t find it there, you can get it on line from many resellers, including of course on Amazon. But the best way to get your copy is to stop by the farm any of the hours we are open and get your copy signed by the author. Just make sure she washes her hands first! The recipes in this book are ones people like. Remember our mission statement is “To delight the palate.” The better tasting the food the more fun this is for everyone. Our current members know that we send an email prior to each pickup. These emails often contain recipes for the vegetables in season in addition to farm updates. So please, be creative and submit your recipes so we can include them in the CSA Newsletter.